Fashion Architect: Obsessive compulsive, moi? The acquisition of, and failure to discard, a large number of possessions that appear to be useless or of limited value (Frost and Gross, 1993). Living spaces are cluttered enough that they can't be used for the activities for which they were designed (Frost and Hartl, 1996). Acquiring possessions compulsively - compulsive buying, or collecting free things. Saving all these possessions and never discarding. Not organizing and maintaining all the saved possessions. Part of the problem for hoarders is that they find it hard to make decisions about what to do with their possessions. A hoarder may feel that something bad will happen if they discard an item or it may feel like a part of their identity will be lost. (...) To avoid these uncomfortable feelings, or distress, a hoarder is likely to choose the "safe" option - postponing the decision, or saving everything. FAB! 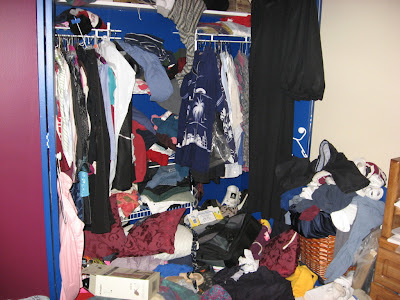 I am right there with you: hoarding tendencies, but not to the point of a disorder. And I purge all the flippin' time, too. 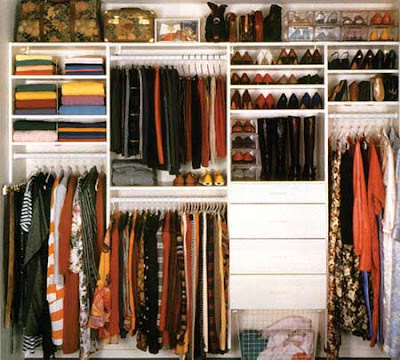 I'll also admit that the freakishly organized closet makes me salivate a little. Further proof of my non-disorder status ... right? I'm a chronic hoarder and even when I do manage to get stuff in order and recycle stuff I just end up with more. Am I the only person who can sell stuff at a car boot sale and still end up buying more stuff to take home with me?